Schlumberger North America has opened a new operations facility in southern Bexar County. Schlumberger, one of the world’s biggest oil companies, has invested $19 million into the area to be closer to the Eagle Ford Shale oil reservoir. The company is expected to hire 100 new employees over the coming months and already employs 400 people. The Eagle Ford Shale oil boom means incredible opportunity for both San Antonio and the smaller cities that surround it. I’m excited about the new jobs, and because I represent District 117, I urge companies to invest in the area in a way that establishes healthy communities for years to come. Regional planning must include roads, power, water and sewer improvements. That way the infrastructure of the small rural towns that surround San Antonio and the Eagle Ford Shale area can handle the population boom and support long-term industry. Another important part of the growth process is creating enough family housing. Oil fields have experienced a rapid increase in vice crimes and drug abuse in the past. Encouraging families to move with their newly hired family member can help prevent history from repeating itself. More families also means a bigger population boost and increased tax revenue, especially for small rural areas. Schlumberger is a great example of the new jobs and increased revenue this oil boom will bring us. We have an opportunity like never before. 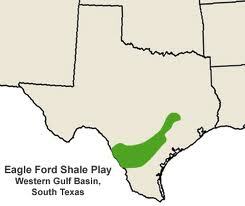 By 2020, the Eagle Ford Shale play is expected to employ close to 68,000 people and generate over $20 billion in revenue. I’d like to see the increased funds used to build more medical facilities and renovate institutions of higher education, since diversifying investment means more economic stability for future generations. Really, the opportunities are endless. I thank Schlumberger for choosing to invest here, and I look forward to what the future will bring. How much will this affect Texans, employment and monetarily? Will this help bring down the price of gas or will the oil be sold to foreign countries? There was a time when Texas did not have a sales tax at all because our Texas oil covered all the needs of Texas. Yes there was a federal excise tax on 'luxury' items such as cosmetics, jewelry and furs and I believe on tires but I don't remember that for sure. I know our telephone was taxed 10% as well because the phone was considered a luxury! That was supposed to be removed but we all know what happened there. The taxes and fees on our telephones, landlines and cell phones are more than that old federal tax by a long shot! I am glad that Schlumberger is doing this in Texas but I just don't know if it is for Texas and Texans. There seems to be a move on to hire illegals over citizens these days.